What are you doing New Year’s Eve? Guzzling champagne, smooching a random stranger at midnight, and making heartfelt resolutions you’ll forget by January 2? Boring! Far more thrilling: dressing up like a dancing bear, choking down seed-filled fruit, or deliberately drizzling dessert topping on your kitchen floor. 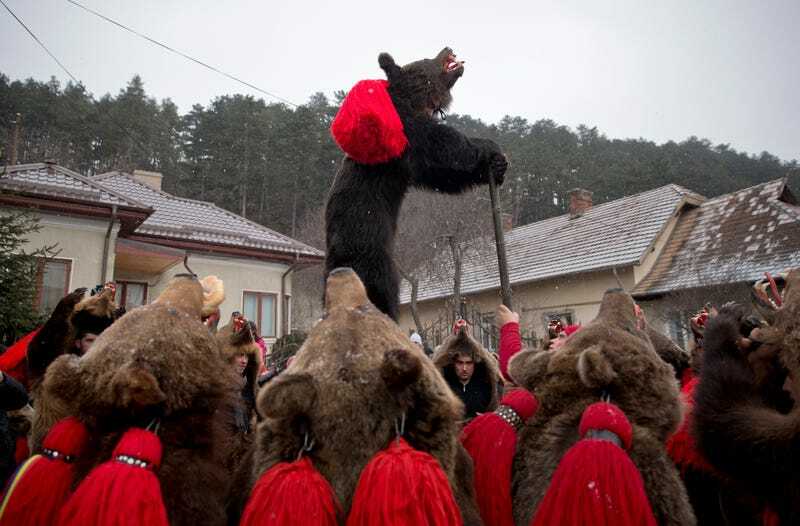 As the photos above and below attest, the sight of dozens of people wearing red tassels and costumes crafted from bear skins is striking and a little bit scary, too. That’s the intention of this traditional festival held between Christmas and New Year’s (these pictures were taken today)—though the dancers aren’t trying to frighten their audience, but rather to ward off evil. Townsfolk would pay the Gypsies in exchange for letting the bear cubs walk up and down their backs — seen as a cure for backache. Older bears would be made to “dance” by being placed on hot metal plates that would make them hop up and down. Alhindawi says this took place as recently as the 1930s. Her grandmother, now in her 80s, recalls seeing Roma leading bears on leashes down from the forest when she was five or six years old. And then, as the crowd starts going bananas, “The possum has landed!” The possum is alive, of course, and will be released at the end of the night unharmed, if a little shaken. The show is more than just the spectacle of suspending in the air a fuzzy-headed, pink-pawed animal that looks as if someone stuck it together with spare parts. There are fireworks, the firing of muskets, country food like peach cobbler and bear stew and the Miss Possum contest, a cross-dressing affair in which bearded truck drivers wear eye shadow and strut across the stage with hands like oven mitts swinging at the sides of bursting lace dresses. People for the Ethical Treatment of Animals is suing over a law the General Assembly passed earlier this year that suspends enforcement of state wildlife rules regarding opossums a few days before and after New Year’s Eve. PETA says the law, sponsored by Rep. Roger West, R-Cherokee, is unconstitutional because it is special treatment for ‘possum drop organizers and makes it unclear what laws apply to people who work to return injured wildlife to their natural habitat. According to the Clay’s Corner website, NYE festivities in the self-proclaimed “Opossum Capital of the World” will begin this year at 10pm. Wearing red underwear on New Year’s Eve to encourage luck in love is a tradition in many countries (including Turkey and Italy) around the world. But in Spain, the ritual includes an even more specific element: eating 12 grapes in time with the chiming of the 12 bells of midnight. The grapes must be chewed and swallowed before the ringing stops to ensure good luck in the year ahead. According to NPR, the origins of this practice date back over 100 years, though the exact reason it began is a matter of some debate (one theory: it was dreamed up by clever grape growers). The grapes, which come from Spain’s Mediterranean coast, are described as “deliciously sweet,” but they also have seeds—an obstacle that can be now be avoided by buying specially prepared packages of 12 grapes, peeled and seeded for maximum ease of speed-eating. In Switzerland, it’s a tradition to eat whipped cream and deliberately spill some on the floor to “guarantee abundance” in the new year. This practice apparently requires either some careful staging or the absence of curious pets, because the dollop of sweetness is supposed to linger as long as possible. Here’s why you should plan your New Year’s Eve party guest list very carefully: the first person to step through your door on January 1 must have certain qualities to ensure maximum luck-bringing returns. In almost all cases the first-footer was rewarded with food, drink, and/or money, and people who fitted the local ideal for first-footer often made a substantial sum by going from house to house (by arrangement) early on New Year’s Day. The seriousness with which some people took the first-foot rules is evidenced in various sources, such as the following reported in N&Q (7s:10 (1890), 5): reporting on a trial in Mansfield (Nottinghamshire), and explaining why a young woman was walking the streets at one o’clock in the morning, it was stated that she had returned from the midnight service at her local church but her mother would not let her into the house until her father or brother came in first, which was some hours later.